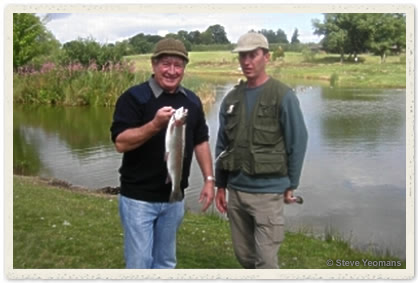 Steve Yeomans runs Midlands Fly Fishing, a professional guide service operating throughout the Midlands, England. Having fly fished for over 20 years, exploring waters throughout the UK, Ireland and New Zealand, Steve has gained extensive experience in stillwater and river techniques. He is a REFFIS approved guide and qualified PAA instructor. Steve’s fly fishing passion is for stalking sighted fish on lakes and rivers. He believes that this style of fishing provides the greatest thrill and challenge modern fly fishers can experience. He now specialises in tuition for novice anglers, plus guiding and coaching fly fishers in the art of sight fishing on a variety of small stillwaters, lakes and chalkstreams. For further details visit Midlands Fly Fishing Guides or call +44 (0)1782 394564 to discuss your requirements. Website: Visit Steve at Midlands Fly Fishing Guides. Mail: Midlands Flyfishing, 9 William Close, Forsbrook, Staffordshire, England. ST11 9AW.